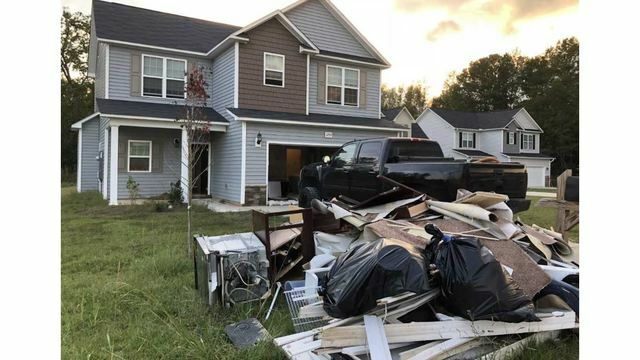 FAYETTEVILLE, N.C. (WNCN) - Fayetteville residents are still recovering from the impacts left by Florence. In the Cedar Falls neighborhood near Cedar Creek Road, piles of debris could be found along Bombay Drive on Sunday. Some have returned to their homes, while others said they're looking for a new place to live. Army Sgt. Roderick Haynes is staying with a friend in Virginia after coming to find his Fayetteville home was damaged during the storm. "It was hurting," Haynes said. "I was in awe. I didn't know what to think. It was my first time going through the experience, and it was something new to me. I didn't know what to do." Haynes had little time to prepare for the storm after returning from a deployment in Africa. "Not having the knowledge and understanding, and someone informing me, or having the insurance to cover half the damages, or all of the damages in that home, makes it more devastating as well, too," he said.